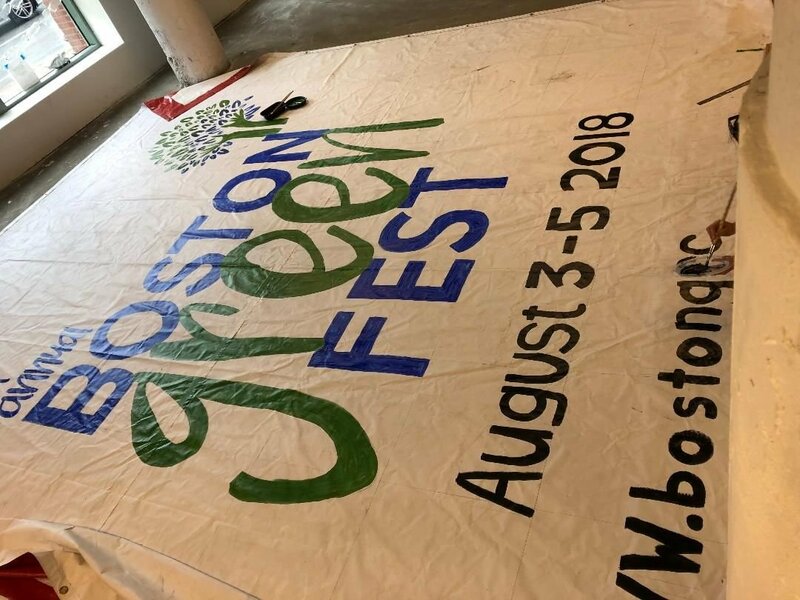 EcoART - Boston GreenFest - Aug. 16-18, 2019 - FREE! Art is an important way to communicate. So much can be felt and said through art. Art is a central part of Boston GreenFest. This year Robyn Reed is our EcoArt Director and is displaying her project, Changing Course at our festival. She uses water bottles that are discarded around Christopher Columbus Park and turns them into beautfiul fish with the help of young children and seniors. It is special to see her installation at Boston GreenFest this year. This art installation [by artist Robyn Reed] was inspired by research about Henderson Island, “the most polluted, most remote island in the whole world,” a tiny landmass in the eastern South Pacific which has been found by marine scientists to have the highest density of debris recorded anywhere in the world, 99.8% of it plastic items. The most common items found on the island were everyday consumer goods – items we think of as ‘disposable’ or ‘single-use’. 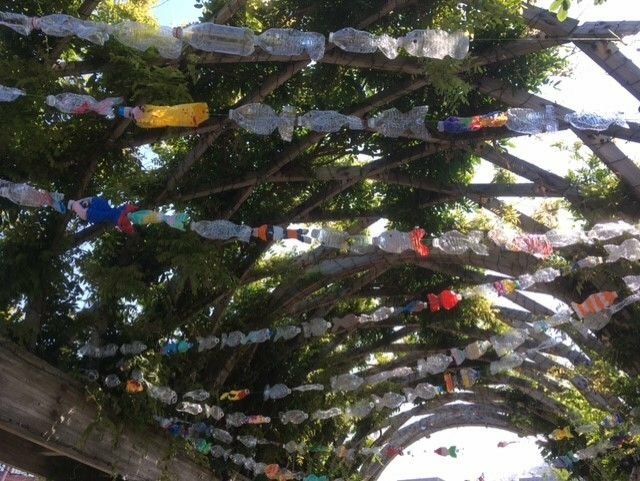 The idea behind the art piece is to show that we can change the course of trash –instead of all these bottles headed toward the ocean, and perhaps eventually to Henderson Island, we can recycle, or limit our use of these plastic items. Also, perhaps people will become more aware of what happens to the trash we use every day, and how quickly it can accumulate. The sculpture consists of hundreds of plastic water bottles collected in just two months from residents and businesses in the North End and Waterfront, painted and hung to look like a school of fish. 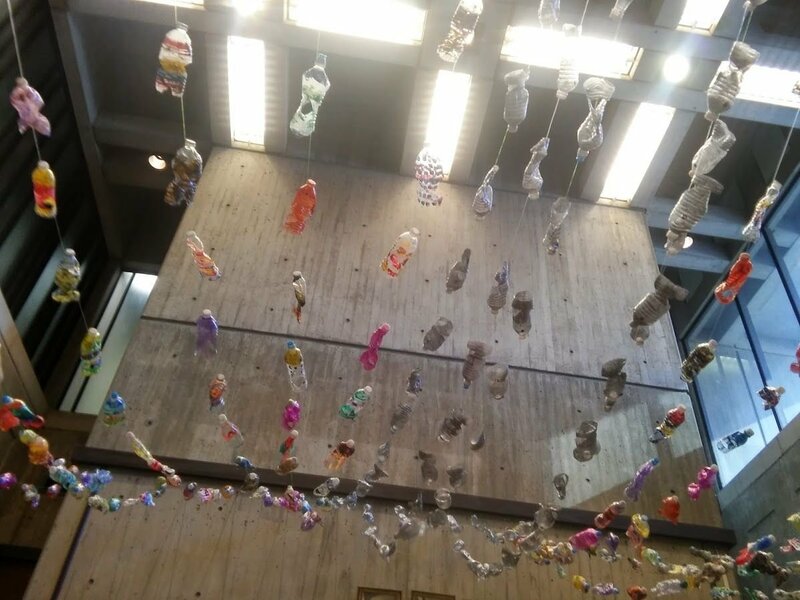 Students at the Nazzaro Center, and residents of the Spaulding Rehabilitation Center, as well as many other local volunteers painted the bottles, and everyone enjoyed participating in making and hanging the fish. Robyn has also helped us be more sustainable by recycling banners that hang from City Hall into banners for Boston GreenFest. You may need to look twice to see that they were hand done. The proof is in her studio before installation!